SALEM - In the basement of his condo, Bowen Kerins is in a super-bonus stage of the game Simpsons Pinball Party. He is playing with five balls. Two of them he has trapped and balanced on the bottom left flipper, a third is on the virtual Springfield Monorail headed back to him, and the other two are about to land safely on the Simpsons' couch if he can time the fourth and fifth flippers correctly. All the while, Kerins is giving a calm play-by-play analysis, explaining his techniques. Kerins, 32, is the world's top-ranked competitive pinball player, having earned the title this spring by defeating a field of 64 players from a dozen countries at the International Flipper Pinball Association World Championship in Las Vegas. "This shot at the top, there's a little flipper that goes into there. I can make that shot almost every time on my own," Kerins said as he fires the flipper buttons and Homer Simpson taunts him. "But the one [they had] at that tournament, it's like one of every 10 shots would go through. So I had to play accordingly." By day, Kerins is a mild-mannered author of high school math textbooks who is expecting his first child this summer with his wife, Nancy. But it is those very logical-thinking and critical-analysis skills his career demands that make him a champion pinball player: Every shot carries risks and rewards. Timing is everything. "If you look at who the top players are, almost all the top players have some math or analytic background," he said. "The game, especially the more recent games, has a lot of risk/reward built in. While you're playing, you make the decision: Do I want to shoot for this thing where if I miss it I might lose the ball, or avoid it?" Kerins has been playing competitive pinball since he was a teenager. He grew up in arcades, following his father, who played regularly. "I started picking it up," he said. "By the time I got to high school, I was playing a lot and going down to the neighborhood arcade and finding myself as the best player in the local area." As one of the balls is coming down in the Simpsons game, Kerins hits it with the flipper, and the ball stops. Junior-year physics says that the ball should have hit Homer in the head or skipped off Bart's skateboard. But it stopped as if someone had put a magnet under it. "That was a good one," he says proudly. The move is called a flip trap, and it's one of the ways that Kerins and other skilled players show that there's more to this game than mashing buttons. Competitive pinball is nothing new; the game itself is more than 100 years old. About 60 years ago, the flipper was introduced. Before that, players just plunged the ball, nudged the table around, and hoped for the best. 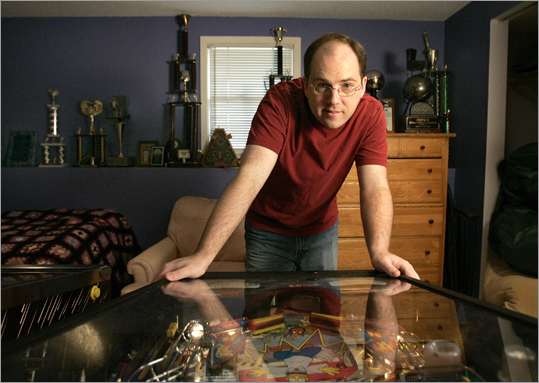 Tournaments, where players take turns trying to best each other's point totals, started to organize around 30 years ago, according to Zachary Sharpe, vice president of the International Flipper Pinball Association. Between games of Simpsons Pinball Party - his favorite - Kerins shared some of the strategy that goes into pinball. First and foremost, players have to time the flippers perfectly to put the ball where they want it. Skilled players can also trap the ball and balance it on the flippers. "Stopping the ball on the flipper, you can stop and think of what your situation is and see what you want to aim for," he said. Then there's the fine art of nudging the table. "You can push the machine around and try to influence where it goes. That's a difficult skill, because, if you push it too hard, you tilt and lose. But you have to push the machine around to some extent," he said. Every table is set to a different threshold of nudging it will accept, and in tournaments, players can't practice on the table beforehand. You won't know the limit until the ball comes crashing down on a tilt. At the tournament in Las Vegas, there were more than 50 tables, with 50 constantly changing tilt thresholds. Kerins's rise in the world of competitive pinball has come at a time when players are losing interest in coin-operated pinball. Video arcades traditionally have served as training grounds for players, but fewer are left standing every year. Arcades have been going out of business, and only one company, Chicago-based Stern Pinball, still makes pinball machines. While pinball video games are available online and for most consoles, virtual pinball is just not the same for Kerins. "Fewer kids are picking up on pinball because they just don't have access to it," he said. "Kids seem to really love pinball when they really see it or play it. And now a lot of people think of pinball as something you play on the computer, when it's so different than that and so much better."